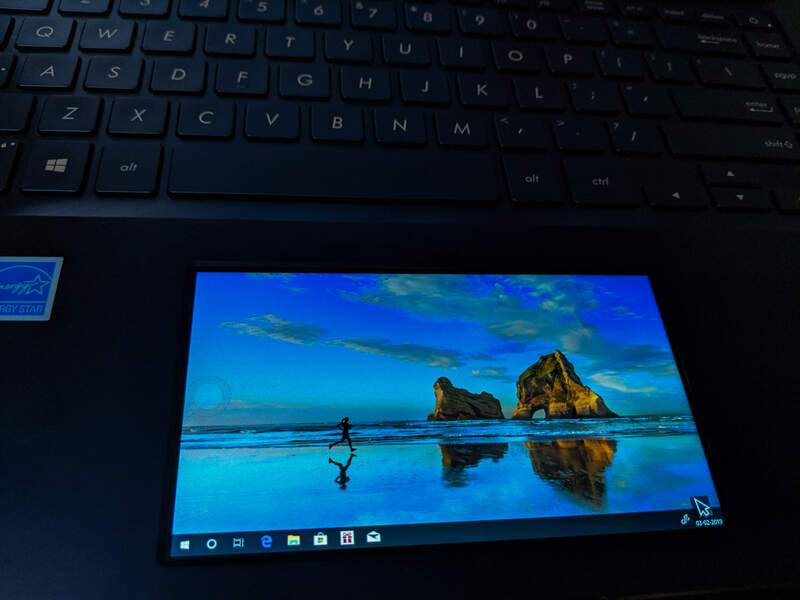 While we have been seeing various innovations in the smartphone industry, there has been very little when it comes to the Laptops/Notebooks segment. The only notable ones are in terms of having higher processing power/memory/cooling technology. Asus has been quite busy launching some quality laptops in every segment over the past couple of years. The latest noteworthy product being the Asus Zenbook Pro which comes equipped with a secondary screen that also doubles as the trackpad. The design is similar to previous Zenbooks but more subtle and a welcome move. There is a rose-gold line chamfered along the edge gives a nice premium look to the Zenbook. We have the LED notification and charging status indicator on the cleft which also makes it easier to open the laptop. 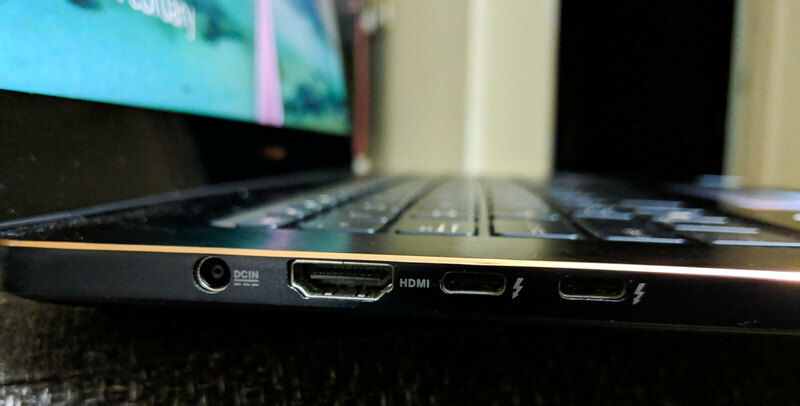 On the left side, we have an HDMI port, charging port and 2 Type-C USB 3.1 Gen2 ports with Thunderbolt 3 whereas the right side houses the headphone jack, SD card slot and 2 USB ports. Overall the design is premium and as expected from the company given this is a high-end laptop. Zenbook Pro comes with a gorgeous 15inch 4K display that is also a touchscreen. The glossy finish on the display is something which not everyone might like given the reflections but otherwise, it is one of the best displays out there. The colors which are Pantone calibrated are very accurate and there is blue light reduction too. The touchscreen is smooth and Asus could have given a stylus as well to take advantage of this display. The keyboard on the Zenbook Pro is a sturdy and comfortable one with a generous 0.6 inch of key travel. 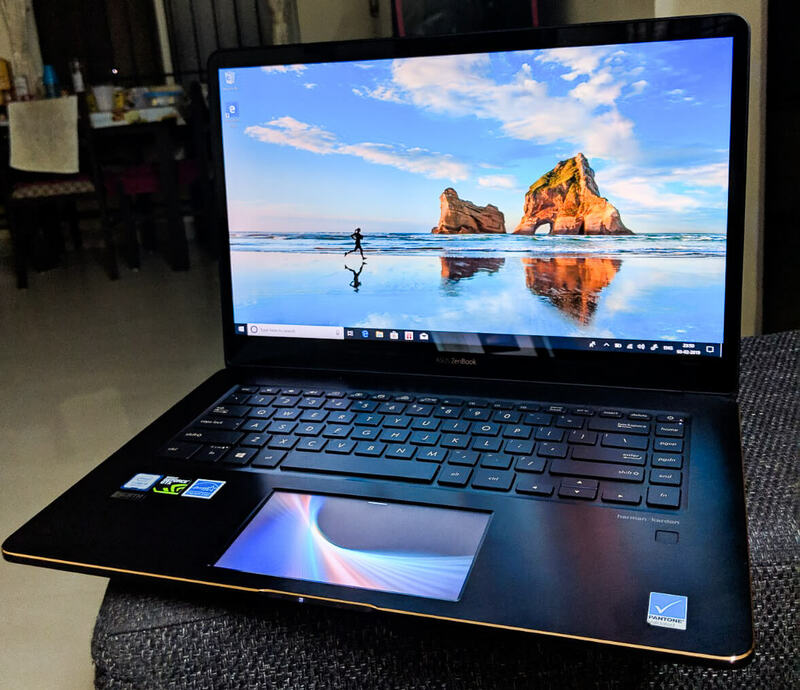 There is no full-fledged num pad like most of the laptops, however, like the other Zenbook laptops, this one too comes with a fingerprint scanner which allows unlocking and other authentication activities. The trackpad on the Zenbook Pro doubles as a secondary screen which is like the first in any laptop I think. 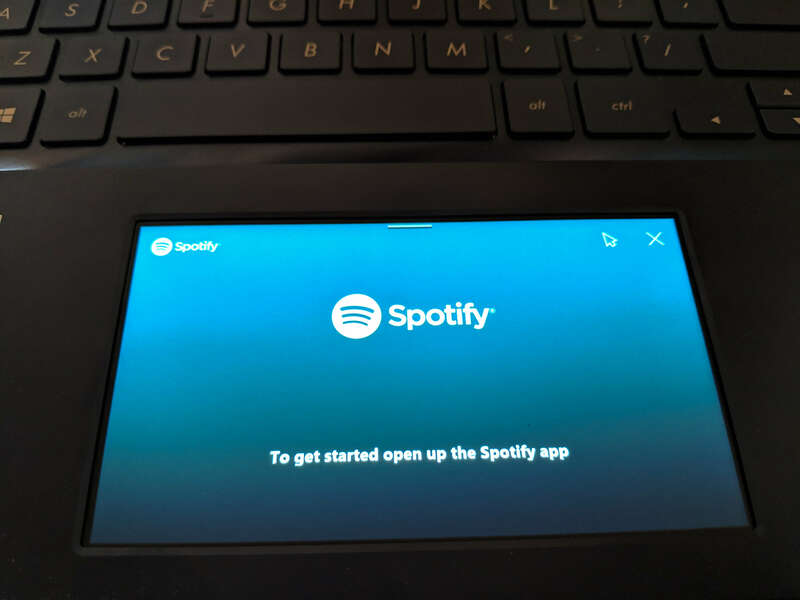 You have a few icons on the trackpad to launch num pad or calculator or even Spotify (once it is launched in India). 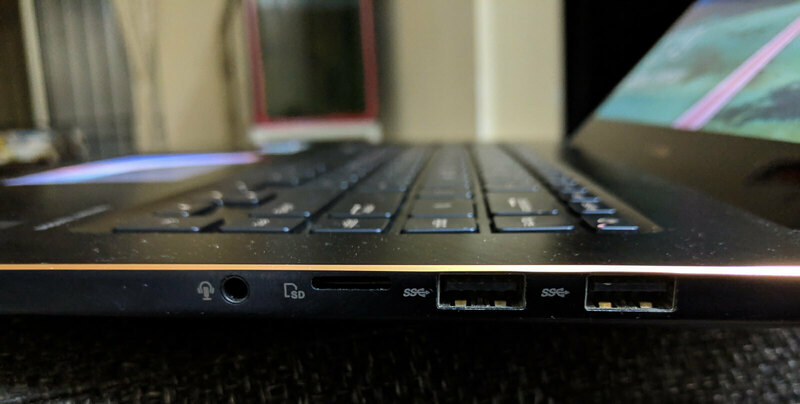 You can even press function F6 key to switch the trackpad into a mini screen which then displays the same thing as the main display and still functions as a trackpad as well. The actual need for this trackpad could be debatable since the only use for me was to switch to Num pad or use the shortcuts to launch apps. Internally, the Zenbook is powered by latest Intel Core i9-8950 HK CPU coupled with 16 GB RAM and 1TB SSD. There is also a 4GB GeForce GTX 1050 Ti graphics card to take of graphics-intensive tasks. The hexa core processor along with the 16GB RAM makes this a powerhouse and provides a good experience in tasks like editing and gaming. The processor is throttled under heavy loads because of the lack of good cooling design. Once the load is high, we see the performance going down a little but it does not impact much because Asus has intentionally slowed down the processor slightly to avoid heating issues. The advantage of this is the good battery life which is over 4 hours when fully charged. Overall, the Zenbook Pro is definitely a very good laptop which has rich features and is very powerful to carry out any task thrown at it. 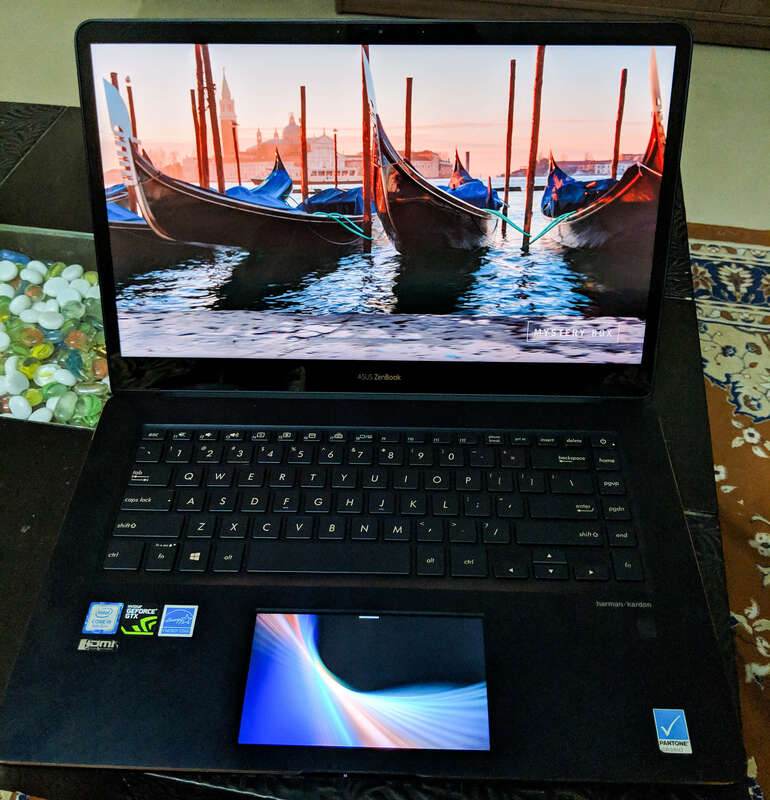 If you are looking at an alternative to MacBook Pro or Surface book, then Asus Zenbook Pro must definitely be on your list just for the gorgeous display and performance.